Франкенштајн или модерни Прометеј (енгл. 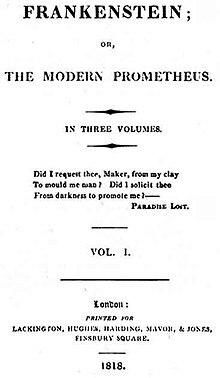 Frankenstein, or The Modern Prometeus) роман је енглеске књижевнице Мери Шели (1797–1851) који је настао 1818, који садржи причу о Виктору Франкештајну, младом научнику који ствара грусно, паметно створење путем једног необичног научног експеримента. Шели је почела да пише ову причу у својој осамнаестој години, а прво издање романа је анонимно објављено у Лондону 1. јануара 1818, кад је она имала двадесет година. Франкенштајн се сматра првим романом научне фантастике. Радња романа почиње када капетан Валтон са својим бродом плови по арктичком кругу. Брод је заробљен у леду. Тада капетан среће научника Виктора Франкенштајна. Виктор прича Валтону своју причу. Као млади научник Виктор напушта свој дом у Женеви у Швајцарској и одлази да студира медицину у Немачку. У једном тренутку инспирације, Виктор проналази начин како да неживу материју поврати у живот. Потпуно опседнут открићем, Виктор почиње од разних делова мртваца да слаже креатуру коју намерава да оживи. Његов је циљ да биће буде прекрасно, али када га оживи разочара се, јер биће је одвратно, превелико и унакажено. Ужаснут, Виктор напушта у бекству просторију и затвара врата за собом. Када се врати са циљем да уништи створење, ово је већ побегло. Следећих неколико месеци Виктор се опоравља од исцрпљености, све док не добија поруку од куће да му је убијен брат. Одмах одлази кући и крај Женеве види створење, те је уверен да је оно убило његовог брата. По Викторовом доласку кући, породична слушкиња Јустине је осумњичена за то убиство, осуђена и погубљена. Виктор одлази у планине и ту проналази чудовиште, које му прича своју причу. Чудовиште је научило да говори посматрајући једну породицу кроз рупу у зиду. Чинио им је, скривајући се, мања добра дела, али када су га угледали, згрозили су се над његовим изгледом. Тада су га отерали. Људи су га терали где год су га угледали због његовог одбојног изгледа. Желећи освету, чудовиште је дошло до Викторове куће, убило му брата и наместило злочин слушкињи Јустине. Сада чудовиште жели од Виктора само једно: моли га да створи још једно чудовиште, женско, да не буде сам. При томе му обећава да ће престати да се свети човечанству и да ће њих двоје живети заједно, одвојени од цивилизације. Испрва, Виктор пристаје. Касније, већ напола направљену креатуру уништава згађен сам собом и својим делом. За освету, чудовиште му најпре убије најбољег пријатеља, а затим и Викторову вереницу у првој брачној ноћи. Виктор тада постаје ловац и прогања чудовиште све до Арктика. Ту умире, пре него што је успео да пронађе и убије чудовиште. Оно се нашло на броду док је Франкенштајн умирао. Франкенштајн је умро, а капетан брода га је срео, те му је чудовиште рекло да ће се убити и отишло је. ^ Stableford, Brian (1995). „Frankenstein and the Origins of Science Fiction”. Ур. : Seed, David. Anticipations: Essays on Early Science Fiction and its Precursors (на језику: енглески). Syracuse University Press. стр. 47—49. ISBN 978-0815626404. Приступљено 19. 07. 2018. ^ Hoobler & Hoobler 2007. Hoobler, Dorothy; Hoobler, Thomas (2007). The Monsters: Mary Shelley and the Curse of Frankenstein. Little, Brown. ISBN 978-0-316-06640-2. Aldiss, Brian W. "On the Origin of Species: Mary Shelley". Speculations on Speculation: Theories of Science Fiction. Eds. James Gunn and Matthew Candelaria. Lanham, Maryland: Scarecrow, 2005. Baldick, Chris. In Frankenstein's Shadow: Myth, Monstrosity, and Nineteenth-Century Writing. Oxford: Oxford University Press, 1987. Bann, Stephen, ed. "Frankenstein": Creation and Monstrosity. London: Reaktion, 1994. Behrendt, Stephen C., ed. Approaches to Teaching Shelley's "Frankenstein". New York: MLA, 1990. Bennett, Betty T. and Stuart Curran, eds. Mary Shelley in Her Times. Baltimore: Johns Hopkins University Press, 2000. Bennett, Betty T. Mary Wollstonecraft Shelley: An Introduction. Baltimore: Johns Hopkins University Press. 1998. ISBN 978-0-8018-5976-2..
Bohls, Elizabeth A. "Standards of Taste, Discourses of 'Race', and the Aesthetic Education of a Monster: Critique of Empire in Frankenstein". Eighteenth-Century Life 18.3 (1994): 23–36. Botting, Fred. Making Monstrous: "Frankenstein", Criticism, Theory. New York: St. Martin's, 1991. Chapman, D. That Not Impossible She: A study of gender construction and Individualism in Mary Shelley's Frankenstein, UK: Concept. 2011. ISBN 978-1480047617. Clery, E. J. Women's Gothic: From Clara Reeve to Mary Shelley. Plymouth: Northcote House, 2000. Conger, Syndy M., Frederick S. Frank, and Gregory O'Dea, eds. Iconoclastic Departures: Mary Shelley after "Frankenstein": Essays in Honor of the Bicentenary of Mary Shelley's Birth. Madison, New Jersey: Fairleigh Dickinson University Press, 1997. Donawerth, Jane. Frankenstein's Daughters: Women Writing Science Fiction. Syracuse: Syracuse University Press, 1997. Douthwaite, Julia V. "The Frankenstein of the French Revolution," chapter two of The Frankenstein of 1790 and other Lost Chapters from Revolutionary France. Chicago: University of Chicago Press, 2012. Dunn, Richard J. "Narrative Distance in Frankenstein". Studies in the Novel 6 (1974): 408–17. Eberle-Sinatra, Michael, ed. Mary Shelley's Fictions: From "Frankenstein" to "Falkner". New York: St. Martin's Press, 2000. Ellis, Kate Ferguson. The Contested Castle: Gothic Novels and the Subversion of Domestic Ideology. Urbana: University of Illinois Press, 1989. Florescu, Radu (1996). In Search of Frankenstein: Exploring the Myths Behind Mary Shelley's Monster (2nd изд.). London: Robson Books. ISBN 978-1-861-05033-5. Forry, Steven Earl. Hideous Progenies: Dramatizations of "Frankenstein" from Mary Shelley to the Present. Philadelphia: University of Pennsylvania Press, 1990. Freedman, Carl. "Hail Mary: On the Author of Frankenstein and the Origins of Science Fiction". Science Fiction Studies 29.2 (2002): 253–64. Gigante, Denise. "Facing the Ugly: The Case of Frankenstein". ELH 67.2 (2000): 565–87. Gilbert, Sandra and Susan Gubar. The Madwoman in the Attic: The Woman Writer and the Nineteenth-Century Literary Imagination. New Haven: Yale University Press, 1979. Hay, Daisy "Young Romantics" (2010): 103. Heffernan, James A. W. "Looking at the Monster: Frankenstein and Film". Critical Inquiry 24.1 (1997): 133–58. Hodges, Devon. "Frankenstein and the Feminine Subversion of the Novel". Tulsa Studies in Women's Literature 2.2 (1983): 155–64. Hoeveler, Diane Long. Gothic Feminism: The Professionalization of Gender from Charlotte Smith to the Brontës. University Park: Pennsylvania State University Press, 1998. Holmes, Richard. Shelley: The Pursuit. London: Harper Perennial, 2003. 1974. ISBN 978-0-00-720458-8..
Jones, Frederick L. (1952). „Shelley and Milton”. Studies in Philology. 49 (3): 488—519. JSTOR 4173024. Knoepflmacher, U. C. and George Levine, eds. The Endurance of "Frankenstein": Essays on Mary Shelley's Novel. Berkeley: University of California Press, 1979. Lew, Joseph W. "The Deceptive Other: Mary Shelley's Critique of Orientalism in Frankenstein". Studies in Romanticism 30.2 (1991): 255–83. London, Bette. "Mary Shelley, Frankenstein, and the Spectacle of Masculinity". PMLA 108.2 (1993): 256–67. Michaud, Nicolas, Frankenstein and Philosophy: The Shocking Truth, Chicago: Open Court, 2013. Miles, Robert. Gothic Writing 1750–1820: A Genealogy. London: Routledge, 1993. Milner, Andrew. Literature, Culture and Society. London: Routledge, 2005, ch.5. O'Flinn, Paul. "Production and Reproduction: The Case of Frankenstein". Literature and History 9.2 (1983): 194–213. Poovey, Mary. The Proper Lady and the Woman Writer: Ideology as Style in the Works of Mary Wollstonecraft, Mary Shelley, and Jane Austen. Chicago: University of Chicago Press, 1984. Rauch, Alan. "The Monstrous Body of Knowledge in Mary Shelley's Frankenstein". Studies in Romanticism 34.2 (1995): 227–53. Selbanev, Xtopher. "Natural Philosophy of the Soul", Western Press, 1999. Schor, Esther, ed. The Cambridge Companion to Mary Shelley. Cambridge: Cambridge University Press, 2003. Scott, Grant F. (1934). „Victor's Secret: Queer Gothic in Lynd Ward's Illustrations to Frankenstein”. Word & Image - 28 (April–June 2012). 28 (2): 206—232. doi:10.1080/02666286.2012.687545. Smith, Johanna M., ed. Frankenstein. Case Studies in Contemporary Criticism. Boston: Bedford/St. Martin's, 1992. Spark, Muriel. Mary Shelley. London: Cardinal. 1987. ISBN 978-0-7474-0318-0..
Stableford, Brian. "Frankenstein and the Origins of Science Fiction". Anticipations: Essays on Early Science Fiction and Its Precursors. Ed. David Seed. Syracuse: Syracuse University Press, 1995. Sunstein, Emily W. Mary Shelley: Romance and Reality. Baltimore: Johns Hopkins University Press, 1991. 1989. ISBN 978-0-8018-4218-4..
Tropp, Martin. Mary Shelley's Monster. Boston: Houghton Mifflin, 1976. Veeder, William. Mary Shelley & Frankenstein: The Fate of Androgyny. Chicago: University of Chicago Press, 1986. Williams, Anne. The Art of Darkness: A Poetics of Gothic. Chicago: University of Chicago Press, 1995. Richard Holmes, "Out of Control" (review of Mary Shelley, Frankenstein, Or, The Modern Prometheus: Annotated for Scientists, Engineers, and Creators of All Kinds, edited by David H. Guston, Ed Finn, and Jason Scott Robert, MIT Press, 277 pp. ; and Mary Shelley, The New Annotated Frankenstein, edited and with a foreword and notes by Leslie S. Klinger, Liveright, 352 pp. ), The New York Review of Books, vol. LXIV, no. 20 (21 December 2017), pp. 38, 40–41. Shelley, Mary Frankenstein: 1818 text (Oxford University Press, 2009). Edited with an introduction and notes by Marilyn Butler. Fairclough, Peter (ed.) Three Gothic Novels: Walpole / Castle of Otranto, Beckford / Vathek, Mary Shelley / Frankenstein (Penguin English Library, 1968). With an introductory essay by Mario Praz. Shelley, Mary Frankenstein (Oxford University Press, 2008). Edited with an introduction and notes by M. K. Joseph. Франкенштајн или модерни Прометеј на Викимедијиној остави. Ова страница је последњи пут уређена на датум 13. јануар 2019. у 07:17 ч.